By Pathma Subramanaiam in Kuala Lumpur. 10 December 2014. The High Court in Kuala Lumpur, Malaysia, today granted Muslim women’s group Sisters in Islam (SIS) leave for a judicial review of a fatwa labelling the organisation as “deviants”. Justice Datuk Asmabi Mohamad dismissed the objections raised by the federal government and ruled that the case is not frivolous. The group filed for a judicial review on October 31 to challenge a gazetted fatwa in Selangor that declared the group as 'deviants' in Islam. The fatwa — which was gazetted on July 31 — was issued without the group being informed or questioned. According to Section 13 of the Syariah Criminal Offences (Selangor) Enactment 1995, any person who gives, propagates, or disseminates any opinion concerning any issue, Islamic teaching or Islamic law contrary to any fatwa for time being in force can be fined up to RM3,000, or jailed for up to two years, or both. SIS named the Selangor Fatwa Committee, the Selangor Islamic Religious Council (MAIS) and the state government as respondents in their application. The fatwa also deemed any publications with elements of liberalism and religious pluralism as “haram”, or forbidden to Muslims, and can be seized by religious authorities. It also sought for local Internet regulator the Malaysian Communications and Multimedia Commission (MCMC) to monitor and block social media websites with content that was against Islam. In his argument to strike out the application for leave today, senior federal counsel Shamsul Bolhasan said that SIS cannot challenge the fatwa as it is only legislated following royal consent by the state ruler. “It is pertinent to note that a fatwa will only become legally binding if assented to by the Sultan of Selangor before it is gazetted, and if the Sultan refuses to assent to the fatwa, it will not be gazetted and will not be binding to Muslims. Since it is the royal prerogative of the Sultan, the making of the fatwa is not justiciable and is not susceptible to judicial review by this court,” he said. He further contended that fatwas were legal opinions issued by Muslim jurists pertaining to Islamic law and should therefore be contested in the Shariah courts. However, Malik Imtiaz Sarwar, the lawyer representing group, told the court that SIS Forum (Malaysia), the firm that operates SIS, is a company registered under the Companies Act, and, as such, is a secular entity outside the jurisdiction of the Islamic justice system. Imtiaz also countered that, as a fatwa is mandated by law, the “deviant” tag on SIS is bound to have serious implications for the organisation. Fatwas are opinions issued by Islamic clerics on a multitude of issues. Although these are advisory in nature, Malaysia occasionally gazettes some into law. Referring to Section 13 of the Syariah Criminal Offences (Selangor) Enactment 1995, Imtiaz noted that any person who gives, propagates or disseminates any opinion concerning any issue, Islamic teaching or Islamic law contrary to any fatwa that is in force can be fined up to RM3,000, or jailed for up to two years, or both. “The people who work for SIS Forum (Malaysia) will be committing an offence,” he pointed out. He added that the issuance of the fatwa itself is not the prerogative power of the Sultan, whom he said only gives his assent, citing a Federal Court precedence on the matter. Imtiaz also argued that the fatwa infringed on powers within the ambit of federal agencies, namely the MCMC and the Home Ministry, which is the only agency with the authority to ban any group or publication. “If the fatwa contravenes the limits of the Federal Constitution, the fatwa itself can be challenged,” he told the court, adding that SIS is not challenging the fatwa per se, but the process by which the edict was formulated. 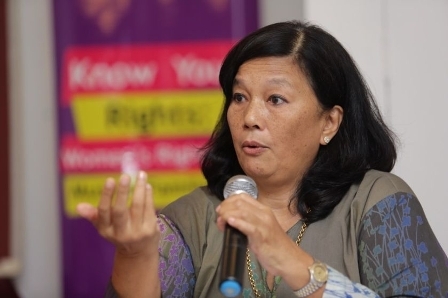 SIS executive director Ratna Osman told reporters outside the courtroom later that SIS welcomed the chance to be heard on the merits of the case. “We will explore the constitutional grounds on how a fatwa can exceed its jurisdiction from the control of religious affairs within the state,” said Ratna.